Four score and 70 years ago, Confederate Gen. Robert E. Lee and Union Maj. Gen. George Meade met in Gettysburg, Pa. and waged a three-day battle that resulted in 51,000 casualties and a significant Confederate setback. Considered the turning point in the war, the battle of Gettysburg, which took place from July 1-3, is as important to Civil War history as President Abraham Lincoln’s address of the same name. Many Americans believe the impact of the Civil War is still felt in politics today, according to a Pew Research Center survey conducted in 2011. 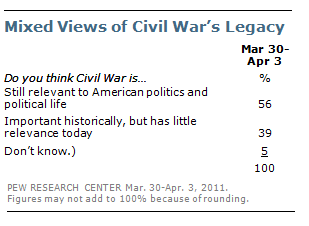 A majority (56%) of Americans think the Civil War is still relevant to American politics and public life; 39% think that though the war was important historically, it has little relevance today. This week, an estimated 11,000 reenactors and 10,000 spectators have descended on Gettysburg to recreate the infamous battle. Steven Spielberg’s “Lincoln,” adapted from a book by Doris Kearns Goodwin, took home awards at the Oscars and Golden Globes this year. And there’s still a strong debate over the ethics of flying the Confederate flag and praising Confederate leaders.